If you really want to enjoy the perfect haircut experience instead of complaining that the scissors are bulky or blunt. Perfect tool for precise cutting of mustache,beard,eyebrows,hair,sideburns.Control your facial hair in the comfort of your own home and get the professional beard look. Constructed from 440C steel - the highest grade of stainless Steel with Coated Titanium for strength and durability. Equipped with adjustable tension screws, which stabilize the blades for longer wear and better resharpening. Finger hole design is moderate,both men and women's hand are suitable.custom design to best fit every individual.And no matter how long you use,the hair cutting scissors will be as sharp as ever. Our scissors are really cut your hair rather than bend your hair. Edge Design: Smooth Slide blade finish allows this shear to slide cut even dry hair without damaging the cuticle,no pulling or tuggling of the hair. Ideal for all motion cutting techniques. 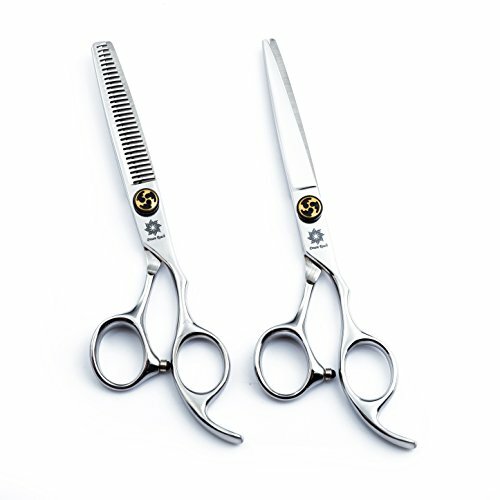 Professional grade hairdressing scissors/shears optimal for both wet and dry basic and mid level hair cutting.